Abstract: This paper studies the Porat Formation (Fm. ), which was deposited along the NE margin of the Dacian Basin part of the East Carpathian foreland (ECF) during the Pliocene and Early Pleistocene. We use a review of stratigraphic data in combination with lithofacies and sedimentary architecture analysis to interpret the Porat Fm. as a large sandy alluvial basin infill with an aggradational structure, consisting of cyclic successions of shallow sandy high-energy braided rivers. Aggradation of the Porat Fan was governed by subsidence of the Dacian Basin, along with a northerly supply of water and sediment from the Carpathians. Along the southern margin of the area the fan entered the Reni–Izmail-Trough, which formed the periodically active gateway between the Black Sea and Dacian basins. Along this trough, the Porat Fm. is developed in a different facies, discerned as the Dolynske Member (Mb. 1), which accumulated in the channel of a large river interpreted as the paleo-Danube. According to mammal stratigraphy of the Porat Fm. this continental-scale river had reached the area by the Gelasian to early Calabrian. The Porat alluvial infill indicates a stable water supply from the Carpathians, which explains the ecologically mixed fauna in its deposits: moistened forested alluvial plain-valleys were present between the zonally semi-arid steppe interfluves. The Porat Fm. and the previously studied late Miocene Balta Fm. are key elements for further in-depth study of the terrestrial evolution (tectonic–sedimentary–relief) of the ECF and north-western Black Sea coastal regions. Abstract: Coral bioherms of the Vršatec Limestone that formed massive, several tens of meters thick complexes during the Jurassic were important sources of carbonate production, with carbonate sediment exported to deeper parts of the Pieniny Klippen Basin (Western Carpathians). However, the age of these carbonate factories remains controversial. New analyses of benthic foraminiferal assemblages occurring in coral bioherms and peri-biohermal deposits of the Vršatec Limestone at five sites in the western Pieniny Klippen Belt (Vršatec-Castle, Vršatec-Javorníky, Malé Hradište, Malé Hradište-Kalvária, and Drieňová Hora) show that these sediments were deposited during the Bajocian and were lateral equivalents of crinoidal limestones and breccias, in contrast to previous studies suggesting that they were deposited during the Oxfordian. First, all sites are characterized by similar composition of foraminiferal assemblages on the basis of presence–absence data, although foraminiferal assemblages in biosparitic facies at Vršatec are dominated by miliolids whereas biomicritic facies at Malé Hradište are dominated by the spirillinid Paalzowella. The composition of foraminiferal assemblages does not differ between the lower and upper parts of the Vršatec Limestone. Second, foraminifer species that were assumed to appear for the first time in the Oxfordian already occur in the Middle Jurassic sediments of the northern Tethyan shelf. Third, the first and last appearances of foraminifers documented in other Tethyan regions are in accordance with stratigraphic analyses and ammonoid occurrences, demonstrating that bioherm-forming coral communities developed on the Czorzstyn Ridge during the Bajocian. Several species of foraminifers of the Vršatec Limestone appeared for the first time during the middle or late Aalenian (Labalina occulta, Paalzowella feifeli) and during the Bajocian (Hungarillina lokutiense, Radiospirillina umbonata, Ophthalmidium caucasicum, O. terquemi, O. obscurum, Paalzowella turbinella, Cornuspira tubicomprimata, Nubecularia reicheli) or appeared for the last time in the Bajocian (Tethysiella pilleri) or Early Bathonian (Ophthalmidium caucasicum, O. obscurum). The composition and diversity of communities with benthic foraminifers of the Vršatec Limestone is similar to the composition of foraminiferal communities on carbonate platform environments with corals of the French Jura and Burgundy during the Bajocian. Abstract: There are two Triassic vertebrate sites in Villány Hills (Southern Hungary), where productive and continuous excavations have been carried out in the last six years resulting in a rich and diversified assemblage of shallow marine to coastal animals. The studied formations belong to the Villány–Bihor Unit of the Tisza Megaunit, which was located at the passive margin of the European Plate during the Triassic. The relatively diverse vertebrate assemblage was collected from a Road-cut on Templom Hill and a newly discovered site at a construction zone located on the Somssich Hill. Four main lithofacies were identified and interpreted in the newly discovered Construction vertebrate site consisting of dolomite (deposited in a shallow, restricted lagoon environment), dolomarl (shallow marine sediments with enhanced terrigenous input), reddish silty claystone (paleosol) and sandstone (terrigenous provenance) indicating that the sediments of the Construction vertebrate site were formed in a subtidal to peritidal zone of the inner ramp environment, where the main controlling factor of the alternating sedimentation was the climate change. However, the recurring paleosol formation in the middle part of the section also indicates a rapid sea-level fall when the marine sediments were repeatedly exposed to subaerial conditions. In the Road-cut site the siliciclastic sediments of the Mészhegy Sandstone Formation are exposed, representing a nearshore, shallow marine environment characterized by high siliciclastic input from the mainland. 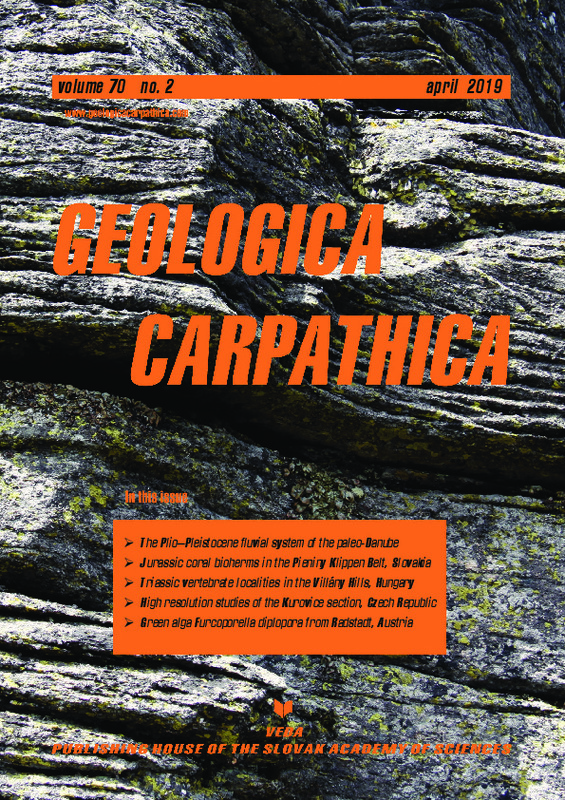 Abstract: Microfacies and high resolution studies at the Kurovice quarry (Czech Republic, Outer Western Carpathians) on calpionellids, calcareous and non-calcareous dinoflagellate cysts, sporomorphs and calcareous nannofossils, aligned with paleomagnetism, allow construction of a detailed stratigraphy and paleoenvironmental interpretation across the Jurassic/Cretaceous (J/K) boundary. The Kurovice section consists of allodapic and micrite limestones and marlstones. Identified standard microfacies types SMF 2, SMF 3 and SMF 4 indicate that sediments were deposited on a deep shelf margin (FZ 3), with a change, later, into distal basin conditions and sediments (FZ 1). The sequence spans a stratigraphic range from the Early Tithonian calcareous dinoflagellate Malmica Zone, nannoplankton zone NJT 15 and magnetozone M 21r to the late Early Berriasian calpionellid Elliptica Subzone of the Calpionella Zone, nannoplankton NK-1 Zone and M 17r magnetozone. The J/K boundary is marked by a quantitative increase of small forms of Calpionella alpina, the base of the Alpina Subzone (that corresponds to NJT 17b and M 19n.2n) and by the rare occurrence of Nannoconus wintereri. Palynomorphs include Early Berriasian terrestrial elements — non-calcareous dinoflagellate cysts Achomosphaera neptunii, Prolixosphaeridium sp. A and Tehamadinium evittii. The depositional area for Kurovice was situated at the margin of the NW Tethys. The influence of cold waters from northern latitudes and potential upwellings is highlighted by: 1) the high proportion of radiolarians and sponge spicules, 2) rare calpionellids represented mostly by hyaline forms, 3) the absence of microgranular calpionellids — chitinoidellids, 4) the small percentage of the genera Nannoconus, Polycostella and Conusphaera in nannofossil assemblages, as compared to other sites in Tethys, 5) scarce Nannoconus compressus, which has otherwise been mentioned from the Atlantic area. Abstract: The dasycladalean green alga Furcoporella diplopora Pia (1918) exhibits a peculiar structure comprising pairs of diverging and rather indistinct pores. Because of such structure, the genus Furcoporella has been a matter of debate. Currently, there is still no agreement on its taxonomic position within Dasycladales. This paper provides a re-description of the type-species F. diplopora Pia (1918), based on Pia’s type material from the upper Paleocene to Eocene reworked carbonates of Radstadt/Pongau, Austria. New observations carried out on this material allowed the acquisition of additional and more complete data on this quite neglected alga. Some morphological characteristics of the thallus, specifically of the laterals are discussed and a suite of potential taxonomic implications are evaluated. Finally, according to interpretations the genus Furcoporella is ascribed to the Family Triploporellaceae and more specifically it should be placed within the tribe Thyrsoporelleae.